Even ignoring “eastmost” (which probably exists as a result of character limits that prevented “easternmost,”) and “penninsula” (which probably exists as a result of the actual word being, like, impossible to spell), you still have “the secret.” Not “a secret.” Not “the secret doorway.” Just “the,” by itself, inspiring you only to poke around the pixely, peninsula-looking thing on the far right part of the map in hopes that you’ll accidentally find whatever surprise this message is trying to inform you of, all in a game that nobody would think of as having a singular, “the”-deserving secret. It actually makes me appreciate the generic townspeople from the Zelda sequel who don’t even bother wasting your time. 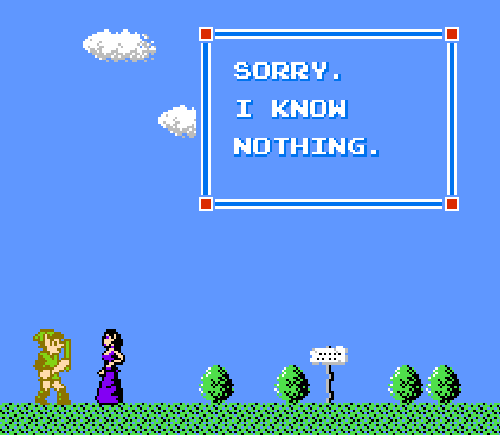 Though you still have to wonder what Nintendo’s plan was in implementing literal know-nothings into a video game. At least she is apologetic about it. Not indicative of my hopes for the new year, just representative of my general world view an expressed through the encompassing lens of video games. I just learned that in the original Japanese, the hint tells you that you need money to shoot arrows. See, that would be more helpful. 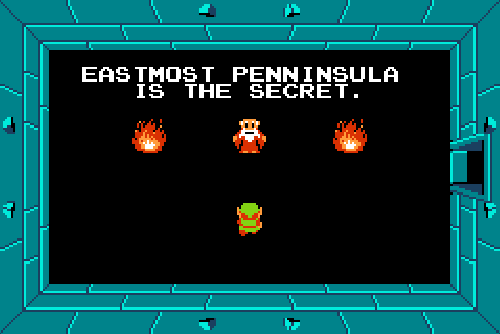 There is only one eastern peninsula, and it holds the money making game, 100 rupees, a heart container, and the letter to the old woman. There is also a warp stair room, two 30 rupees rooms, a dungeon, another heart container, the shop with keys, the shield and the candle, and a medicine shop within just a few screens, making the peninsula and the surrounding area one of the most important and helpful areas of the game. Seems like a pretty accurate message to me.